Very difficult to categorise this CD, unless it�s under that ever-growing category called �uncategorisable� � which I suspect would appeal to Rob Rogers, the creative mind behind the music.� All the oboe playing on the disc is by Rob, often multi-tracked as many as four or five times.� The booklet explains that the rhythm tracks (i.e. piano/synthesiser, bass, guitar and drums) were laid down first, after which the wind instruments, including Steve Lock�s bassoon and contra, were added. Rogers has an interesting background; having been born in London, he nevertheless spent much of his childhood in Venezuela.� The family then moved to rural Scotland where Rob grew up, going on to study at the Royal College of Music in London. He now operates from his base in Suffolk, where I assume this music was recorded and edited together. 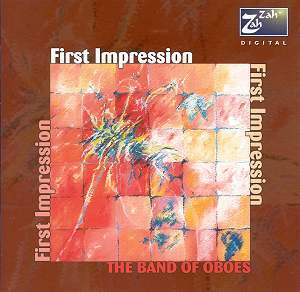 So this is very much a studio product, and, at first hearing, it�s quite difficult to imagine this music being reproduced �live�.� Interestingly, however, the booklet explains firstly that the initial inspiration came from a live performance � a quartet of two cor anglais and two oboes d�amore in Bach�s Christmas Oratorio � and secondly that some of the material has been performed live, and more is planned. What we have here, anyway, is a unique sound, or rather unique sounds, because there is quite a lot of variety, from a track like Mr Cheesy Smiles on which all seven wind instruments play (i.e. three oboes, two cors, bassoon and contra) to the three short pieces that make up Onomatopoeia, which are for just oboes and cors anglais (though with gentle drum-kit in the last one).� The idiom is mainly jazzy, and there�s quite a bit of improvisation.� This is impressive, because the oboe is such a difficult instrument, and simply doesn�t have the innate flexibility of clarinet, sax or even trumpet.� But Rogers is an extremely skilful player, and throws most of his solos off in the right laid-back way � though just occasionally the strain does show!� And I was struck once again by the close affinity between the tone of the oboe and a soprano saxophone in certain registers - the same goes for cor anglais and alto sax. Tell me, man is simply a play on the name of Telemann, tracks 12 to 15 being based on the four movements of his A minor Sonata for oboe and continuo� This is given� the �Jacques Loussier treatment� with enjoyable results. Once you�ve absorbed the attractively ambivalent idioms and the unusual sound-world, this is really a delightful CD to listen to.� There is a freshness about the music, an unpretentious feeling of discovery, and a great sense of fun too, all of which is highly infectious.� I have my favourites � I loved Dalyan, inspired by Turkish music, and with an elusive hint of heterophony (a feature of much Middle Eastern music where different instruments play almost the same melodic line but not quite! ), Lost Cause, with a beautiful guitar solo creating a dreamy atmosphere, and the wild Reel Motivation, combining Scottish folk-dance and jazz-funk � Hoots Mon it�s cool! Rogers has brought together a superb band of highly talented players, and the excellent news is that the booklet contains the promise of more CDs in this vein to follow.� This really is something different, unassuming, yet pulled off with aplomb.